Anything he can do, I can do better. At least that was what Cassie Bucknell thought before she pinned on Ben Wilder’s badge and took to patrolling the streets of Cactus Creek, Texas. Cassie has been in love with Ben since primer school, but Ben treats her like a little sister. 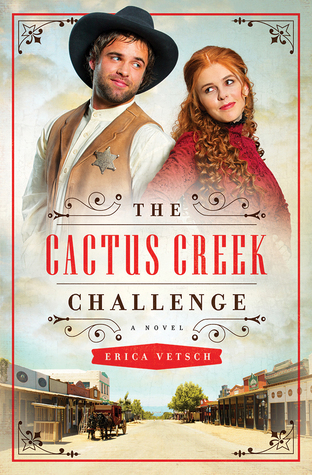 When they are picked to swap jobs for a month as part of the annual Cactus Creek Challenge in their Texas hometown, the schoolhouse is thrown into an uproar, the jail becomes a temporary bank vault, and Cassie and Ben square off in a battle of wills that becomes a battle for their hearts. The whole idea of a competition involving a sheriff, a teacher, a baker, and a livery owner switching jobs for a month sounds hilarious, and it is, but there's a deep, sensitive side to this fun tale that stole the story and stole my heart. The main storyline of Cassie's trying to make Ben see her as a grownup will send you rolling with laughs. This book would make a great western movie. The kind my family could watch over and over. To find out more about Erica and her books, check out her website. Hello Natalie. I am a Pastor from Mumbai, india. I am glad to stop by your blog post where you have a book review. I do like book reviews but you will forgive me if I do not comment on it and take this as an opportunity to get connected with you as a Preacher's kid. I am also blessed to know that you are a Christian Fiction writer. I am truly blessed and feel privileged and honored to get connected with you because of who you are in the Lord Jesus Christ. I have been in the Pastoral ministry for last 37 yrs in this great city of Mumbai a city with a great contrast where richest of rich and the poorest of poor live. We reach out to the poorest of poor with the love of Christ too bring healing to the broken hearted. we also encourage young and the adults from the west to come to Mumbai to work with us during their vacation time. We would love to have you come to Mumbai to work with us during your vacation time. I am sure you will have a life changing experience. My email id is: dhwankhede(at)gmail(dot)com and my name is Diwakar Wankhede. Looking forward to hear from you very soon. God's richest blessings on you, your family and friends and also wishing you a blessed and a Christ centered rest of the year 2016.